This is work in collaboration with Oliver Brdiczka, formerly at PARC, and our former intern, Laurian Vega. Yet another CHI reject, because the reviewers didn't get that this was a technique paper and wanted us to have built an application instead of just reporting on the method. Sometimes I can't believe the randomness of CHI reviews. Oh well... So, instead, we applied for a patent (still under examination). In this project we sought to determine how accurately we could spot desk-based work activities like writing a paper or preparing an invention submission by crowdsourcing the text strings (i.e., keyword features) that would appear in a user's input stream; that is, in keyboard input, active application windows, file names, and in applications they use. We then counted them when they occurred. This figure below shows someone’s input stream when an activity is being spotted as the height of each time-interval’s feature count rises. Detection of features of a paper writing activity over time. When a feature is detected, it is assigned a number of points which deteriorate over time so that, as more features are detected, peaks spring up which gradually decay if no more features are detected. For patenting and paper writing activities we asked individuals about features of their own activities, local experts about such activities at their own organization and general experts about features at any organization. Individuals reviewed their own logs and their estimates of what they were working on agreed 80% with experience sampling (ES) surveys at the time (i.e. “what are you working on now?”). Using their features we were also up to 80% accurate compared with ES. Local and general experts’ features also did quite well by comparison. Percentage accuracy of correctly spotting an activity Baseline occurrence of activities was roughly 10%. 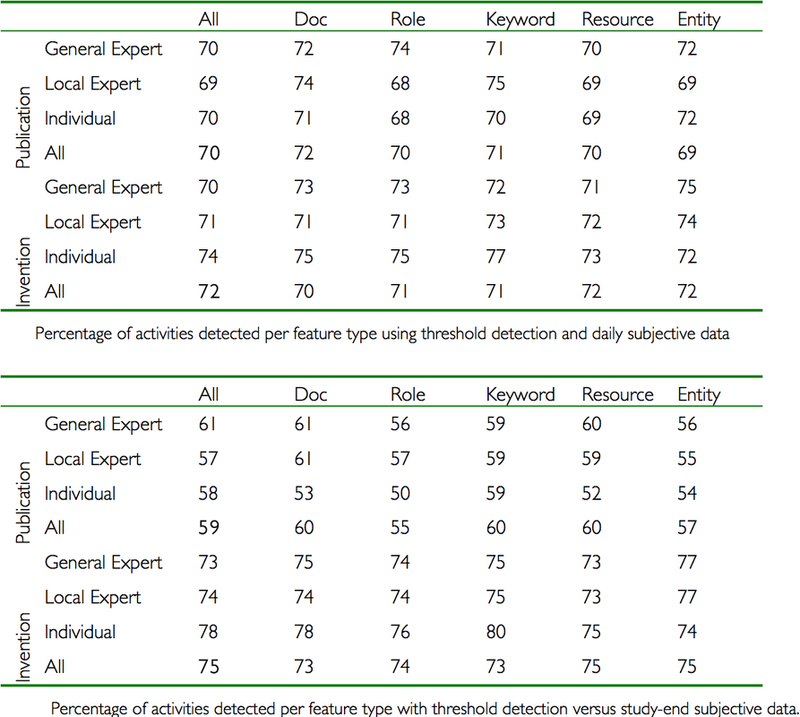 Human accuracy of spotting own activity from logs compared with experience sampling is 80%.